Solar energy is being used in a number of applications already, but carports are something new. Japan-based Sankyo Tateyama Aluminium has begun selling carports [JP] with solar power generation systems installed on their tops. The main idea is to attract both customers who aren’t able to install solar panels in their homes and those who need to boost the amount of solar energy in their houses. 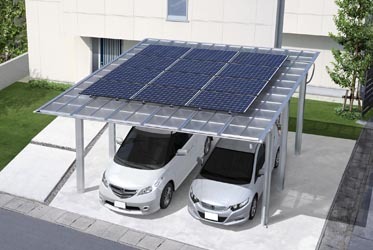 The so-called M.Shade carports can accommodate two cars maximum and come with extra-strong pillars that support the weight of the solar panels on top of them. Home owners get total of twelve solar panels (5.6×5.4m) that provide 2,235kW per year. Sankyo says this is enough to cover about 50% of what a typical household needs on a yearly basis. The M.Shade sounds definitely like a good idea but comes at a pretty high price ($40,000 excluding installation costs). Sankyo does sell products internationally but hasn’t said anything yet about bringing its green carport to markets outside Japan.